Soups were easily digested and were prescribed for invalids since ancient times. The modern restaurant industry is said to be based on soup. Restoratifs (wheron the word "restaurant" comes) were the first items served in public restaurants in 18th century Paris. Broth [Pot-au-feu], bouillion, and consomme entered here. Classic French cuisine generated many of the soups we know today. Advancements in science enabled soups to take many forms...portable, canned, dehydrated, microwave-ready. "Pocket soup" was carried by colonial travellers, as it could easily be reconstituted with a little hot water. Canned and dehydrated soups were available in the 19th century. These supplied the military, covered wagon trains, cowboy chuck wagons, and the home pantry. Advances in science also permitted the adjustment of nutrients to fit specific dietary needs (low salt, high fiber, etc.). "Cereals, roasted to make them digestible and then ground and moistened or diluted with water to make a paste, either thick or thin, did not become gruel or porridge until people had the idea and means of cooking them. They may initially have been cooked by hot stones in receptacles of natural substances, and then in utensils which could go straight over the fire. Soup, in fact, derives from sop or sup, meaning the sliced of bread on which broth was poured. Until bread was invented, the only kind of thick soup was a concoction of grains, or of plants and meat cooked in a pot. Gruel or porridge was thus a basic food, a staple from of nourishment, and long held that place in Western countries, for in practice bread was a luxury eaten only in towns. A thick porridge of some kind is still the staple food of many peoples, and it is not always made of cereals, but may consist of other starch foods: legumes, chestnuts or root vegetables." Cold soup, really? Yes! In most countries, cuisines and periods; for starters, dessert or holiday fare. We Americans are not collective fans but we are intrigued. Especially when the heat is on outside. In dutch oven, heat oil over medium heat. Add ground Italian sausage, and cook until no longer pink, breaking meat up as it cooks. Add onions and carrots, cook for 5 to 6 minutes. Stir in black beans, diced tomatoes, chicken broth, salt, pepper, oregano, basil, garlic, uncooked elbow macaroni and celery. Stir well. Bring to a boil, reduce heat and simmer for 30 minutes, uncovered. Serve with crusty Italian bread, or serve with your favorite crusty bread. Enjoy! Ooh, that looks so good. It is five below here, and that looks like the perfect warming supper. Sounds delicious I made an ITalian veggie soup tonight and posting tomorrow, wished I had seen this first I would have added the sausage great idea! Happy New Year! Great recipe for those cold, wintery days that are heading our way. Yum! Italian soup is one of my favorites. This looks wonderful! That is one wonderful meal. Happy New year! This soup looks wonderful and perfect for the weather outside. As always, good stuff! Happy 2012! I'm looking forward to more of your appetizing recipes! Your soup sounds so good today! We now have 50mph wind gusts. soup warms your body and your soul. Happy New Year! I'm looking forward to more delicious recipes, and food history. YUM! Christine - very nice picture! I LOVE soup - one of my favorite things to eat and make! Happy New Year! I hope 2012 will be full of health, love and happy moments! Thanks everyone! Your comments mean so much to me. 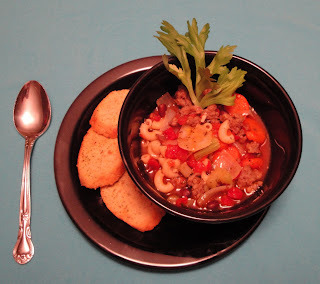 This is a delicious and hearty-looking soup, Christine! I love italian soups -- so comforting! It's been a pleasure to know you since last year, and looking forward to staying in touch for the new year! It's been a pleasure to know you too. Keep in touch! Happy New Year! looks fantastic Christine. Happy New Year! This is a lovely meal and Congratulations on Today's Top 9! Great recipe! Warm soup is the best thing during the winter. Congrats on Top 9! Sounds and looks like a great soup, Christine! I will never turn down anything with Italian Sausage in it. Thanks everyone. Y'all are the best.